Just like to thank Gordon for his patience and expertise in getting me through my test at first attempt. Learning with Gordon was fun and interesting. Helped put me at ease as well as I was very nervous. Gordon has been a great instructor. He has been great to learn from and I gave enjoyed every minute of learning even when not getting things right. Thanks for everything Gordon. Learning to drive with Gordon has been a pleasant and very enjoyable experience. Was able to learn better due to the ld system that Gordon used and was made easier by Gordon's teaching methods. Would definitely recommend to friends and family. Great, friendly and happy teacher. I have really enjoyed learning to drive with Gordon. He has helped me every step of the way since I started as a very nervous learner. With the use of the LDC system it made it easier to understand. He was very patient with me and a great teacher. I will definitely be recommending him to everyone who wants to learn to drive. 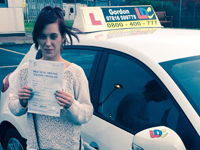 Passed her driving test in Kirkcaldy. Gordon has been the best instructor I've had and I've had 4 instructors. Gordon is very patient, listens and makes learning fun. He breaks things down so it's easy to understand and achievable. Thanks again Gordon. Gordon was an excellent instructor. Give good praise and builds confidence, which I was lacking greatly, which helped me no end. 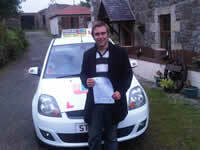 Likes to challenge you, very likeable man which helped me pass 1st time. Can't praise highly enough. Will definitely recommend. 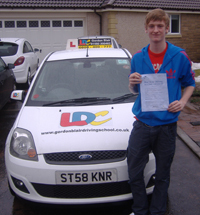 Passed his driving test in Kirkcaldy with only 2 minor driving faults. 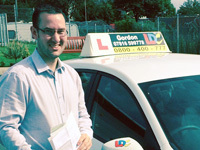 Gordon was an excellent instructor and great teacher who got me through my driving test reasonably quick. A great car to learn to drive in and absolutely delighted. Will definitely recommend. Thanks again Gordon. Gordon is a brilliant instructor who has so much patience. Never thought I would be able to drive never mind pass the driving test. Would definitely recommend. Learning to drive with Gordon was fun, exciting and enjoyable. Gordon broke things down to make it more easier to understand which was good for me. 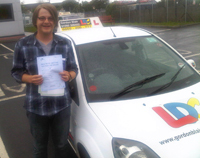 He was also patient which is what I needed and I would definitely recommend him to anyone wanting to learn to drive. 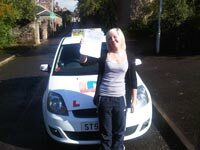 Passed her test in Kirkcaldy on her 1st attempt. I really enjoyed learning to drive with Gordon. I enjoyed using the LDC System with the workbook as it helped me to understand what I was doing. Gordon is a calm and considerate person who explains things and makes things clear and would recommend Gordon to everyone. Due to work reasons I had to commit to an intensive driving course. I came across Gordon online and found Gordon's training to be extremely professional and well organised. 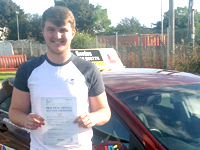 His friendly manner helped no ends along with his use of the LDC system and would recommend him to anyone wishing to learn to drive. I wanted to drive due to work. Gordon was a very friendly and patient instructor who spoke to me on my level. Each lesson was broken down and organised through the LDC system which was good. I couldn't imagine driving with anyone else. I will be recommending to Gordon to anyone wanting to drive. 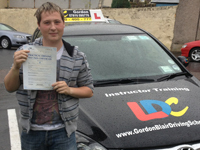 I passed first time with Gordon. I think the way he taught me was perfect, not too tough but not too easy either!! The LDC system is really an effective way of learning to drive as I always knew what I was going to be doing on my next lesson. I always knew what I was doing wrong and he showed me what I had to improve on. I really enjoyed learning with Gordon and would definitely recommend him to everyone. 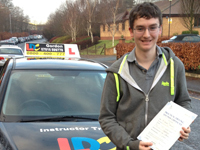 Thanks to Gordon and the LDC System that he was using I was able to pass my test 1st time. Gordon is very good at explaining things and doesn't make you feel stupid if you don't get it right. He is very patient and will definitely recommend him to family and friends. 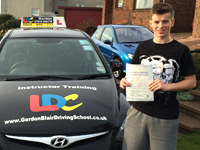 I passed 1st time with Gordon from LDC. 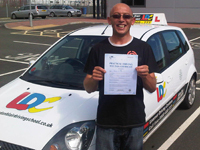 He is a fantastic instructor, easy to get on with and made me feel relaxed and confident with my driving. The LDC System was very helpful, it informs you of what you will be practising each lesson before you do the lesson. Therefore I had a better understanding of the lesson ahead. Thanks Gordon. 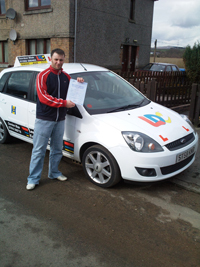 Passed his test in Kirkcaldy. Gordon made learning to drive very easy. 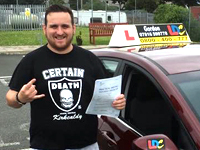 It was made easy by using the LD System which was broken down into easy to understand segments and has made me a competent driver.He is an excellent instructor who I'll definitely recommend to my friends and family. 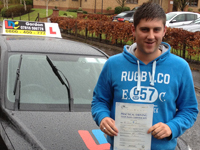 Gordon was a great driving instructor which he helped helped get good driving experience which enabled me to pass my test. All the manoeuvres and subject were well laid out in a structured manner through the use of the LDC system which is great. I'm glad I went with Gordon. Gordon was very easy to get along with. was very patient and friendly and good at explaining things. Really enjoyed learning with Gordon. Gordon helped me so much. He was very patient and gave me lots of reassurance which I needed. Without his guidance and the use of and Gordon's knowledge of the LD System along with the DVD's which were great it would have taken me many more hours and I wouldn't have passed 1st time. The LDC System gives you theoritical and practical help along with a dedicated instructor. Thanks Gordon. Gordon you're a star!! Gordon was great. 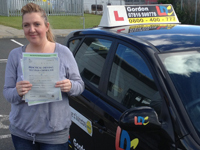 I really enjoyed learning to drive with Gordon and I think the LDC System helped me so much along with Gordon's patience and understanding of what I needed. I would definitely recommend Gordon to friends and family. 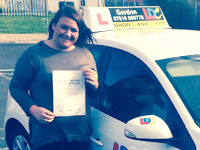 WooHoo I passed my driving test all thanks to Gordon. He is the only driving instructor that I have had that has managed to get me to understand manoeuvres. Just wish I had Gordon for the the first 3 tests that I took my tests, Thanks Gordon. I would like to thank Gordon for his patience, knowledge and time spent on things that I took a little longer to grasp but he always very patient and treated me as an adult, not made me look stupid just because i wasn't getting it. His knowledge and the ease of use of the LDC System helped enormously, I would definitely recommend him to anyone. Thanks Gordon. I really enjoyed learning to drive with Gordon. He was very patient with me.. I like the LDC System as you always knew what you were going to do next and the workbooks are good as well. I will definitely recommend Gordon to friends and family wanting to drive. Gordon is a good instructor and I feel great that I have passed 1st time. I would recommend him to anyone and I am glad that I was with Gordon, big thank. Gordon was amazing, he was very patient, calm and knowlegeable about the LDC System. 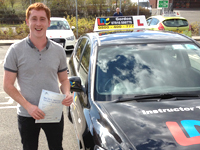 I really enjoyed learning to drive with him and would recommend him to everyone. I had a couple of instructors before Gordon and I didn't enjoy my lessons. But Gordon is very poitive, encouraging and his methods of teaching using the LD System are very clear and easy to understand. He is a very good instructor and has taught me more than what was required for the test and will Definitely recommend him to friends. First class instructor, glad I found him. Very patient and breaks it all down into easy to understand segments. 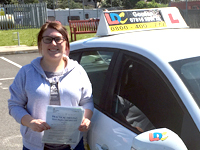 Passed her test in Kirkcaldy. 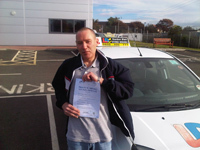 I thought Gordon was a fantastic instructor and was very patient, calm friendly. 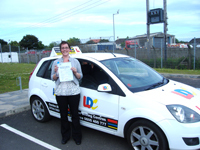 The LDC system was easy to follow, I enjoyed learning to drive thoroughly. Thanks. Learning to drive with Gordon was fun. It was made easy using the LDC system as I always knew what I was going to to next and he made you feel very confident that I was always going to pass. 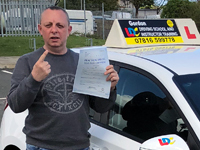 Passing my driving test was made easy by Gordon's easy going nature and his ability to make you feel at ease along with the LDC system and his knowledge of it. Thanks again!!. I found that Gordon's way of teaching me how to drive easy to understandthrought the use of his LDC system and it also helped me pick things up quickly. I thought when driving with Gordon he was very understanding and patient with me and pushed me to be above the standard needed to pass. 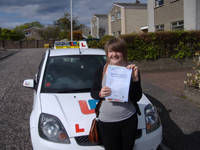 Amy passed her test in Kirkcaldy. I found learning to drive harder than I thought it would be. 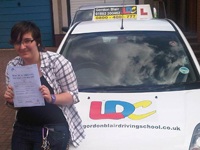 But throughout my driving lessons with Gordon I was able to improve my confidence and with practise was able to pass. 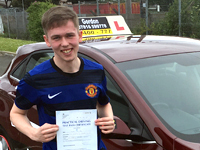 I found driving lessons with Gordon was very constructive and very well laid out and set out to a very high standard to make you not only be able to pass your driving test but to drive safely on all types of roads which I did 1st time and with NO FAULTS AT ALL. 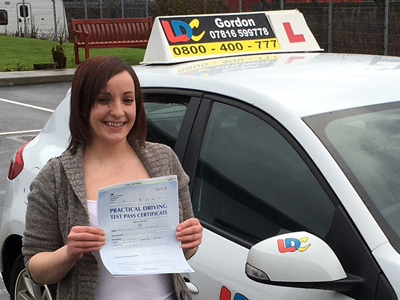 Samantha passed her test in Kirkcaldy. Gordon is a very good instructor. He built my confidence right up and taught me to not act on my nerves. I came to Gordon after 6 months learning with a different driving instructor and I learned so much more even in the 1st week.Thank you so much Gordon. 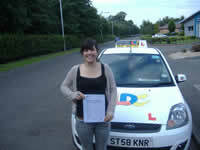 Samantha passed her test in Dunfermline. Learning with Gordon was a great experience. It was done at a good pace and anything i wasn't sure of he went back over. I was made to feel very comfortable during the whole learning process and will be happy to recommend Gordon to friends. Thanks again Gordon! You did a great job Gordon. I mean I passed! You pushed me to do my best and you made it easier with your many hints and tips. 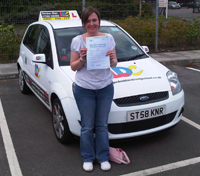 I would recommend you to anyone who would need driving lessons with a professional, learning and fun experience. I wish you all the best and cannot thank you enough for all your help and advice. Throughout my lessons Gordon was a very good instructor. He was very patient with me I appreciated and it made learning to drive more fun him. 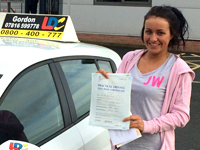 "Gordon is a fantastic instructor with a very positive attitude. Always has a very professional manner and strict (in a good way) when necessary. I was previously with another instructor prior to Gordon and have learned more from Gordon in a much shorter space of time. Would recommend him to anyone"
Very good, teaches a lot, good to get along with, top class instructor. I'm glad to have passed my test. Gordon has been really patient and shown me me the correct way to drive safely. He is a great instructor, thanks again Gordon. Gordon Blair what can I say, well I passed 2nd time due to Gordon's great teaching, strict when he has to be but a joy to learn with and would recommend him to everyone I know. "An amazing instructor. Gordon is kind, calm and very patient. He is very easy to talk to and will explain in detail if you do not understand. Ask any question and he will answer without making you feel stupid". 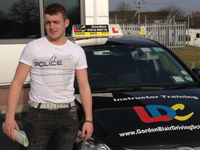 Gordon is a really friendly instructor, puts you at ease and make learning fun and enjoyable. I had been with 2 different Instructors before Gordon and failed both tests. When I came with Gordon he taught me things I never knew!! He increased my confidence and was always willing to slot me into his busy schedule to suit me. Just want to say a MASSIVE thanks and Gordon you're a legend!! Gordon is by far the best instructor I have had and I have had about 5. He is patient and has taught me so much. I had been taking lessons for 4 years but passed with Gordon within four months. Thanks for everything Gordon. Gordon was very patient and extremely encouraging. His teaching style is very relaxed even when you make mistakes. I wouldn't hesitate to recommend him to anyone. A truly enjoyable learning experience. thank you Gordon. 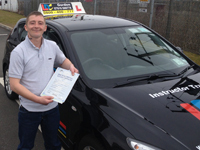 "Gordon is a fantastic instructor. Passed first time! Great confidence builder, calm and patient. Don't go anywhere else". 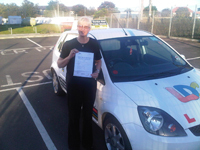 "I thought that Gordon was a good instructor who has lots of patience and makes you feel relaxed when in lessons. I would like to thank Gordon very much for all his time and patience and I would recommend him to anyone". 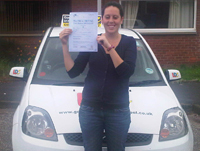 "I started my driving lessons with no confidence & extreme nerves. Through the course of my tuition however, Gordon motivated & encouraged me & delivered the lessons with amazing patience & calmness. Despite my neves, we still managed to have a laugh. I could never have imagined passing my test, yet here I am out here driving in my own car and loving the independence and freedom it brings. I can't thank Gordon enough for his guidance and would highly recommend him to everyone". 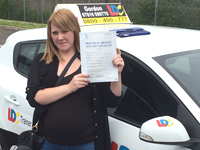 "Gordon is a great instructor and fills you with confidence. I would highly recommend him to anyone. Cheers". Driving with Gordon has been interesting. He had someting interesting to talk about every lesson. 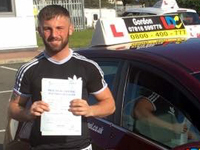 He made sure that I was ale to progress at a level suitable to my ability and I would recommend any driver to give Gordon a phone and arrange lessons. 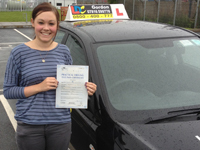 Kaitlin passed her test in Kirkcaldy, Fife. "Gordon - One word - SUPERB. He was very patient and supportive. Made learning fun. One of the friendliest men I have ever met. Thank you Gordon". 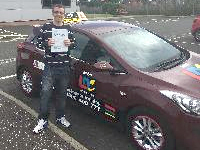 Andy passed his test in Kirkcaldy. "Gordon has an excellent manner, polite, provides an excellant service and would recommend him to anyone". 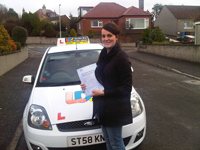 Tracy passed her test in Kirkcaldy. "Gordon is very patient and puts you totally at ease. I would highly recommend him to anyone". 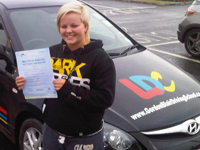 Sammie passed her driving test in Kirkcaldy. "Gordon was really patient with me. He's a really good instructor and makes things easier. 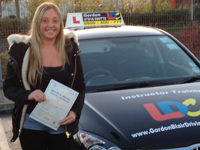 I enjoyed learning to drive with Gordon". 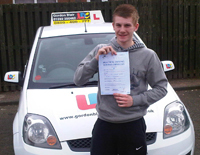 Joe from Windygates passed his driving test. 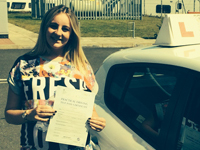 "Thoroughly enjoyed learning to drive. Gordon is fantastic and incredibly patient. No more busses, thank you very much. 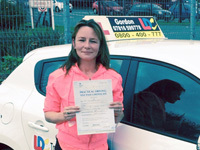 Viv from Glenrothes passed her driving test. 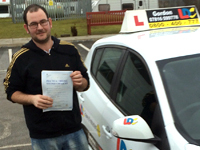 "Gordon was a really patient instructor. He is very easy to get along with and talk to". 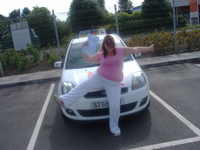 Louise from Kinross passed her driving test. 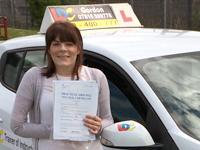 "I really enjoyed learning with Gordon. He was very patient and gives good support". 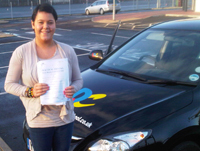 Meshell passed her driving test. "I enjoyed every minute of learning with Gordon. He is very confident in what he is teaching and make learning fun. He will always ensure that your driving experience is fun and safe. Thanks G. Your simply the best!!" 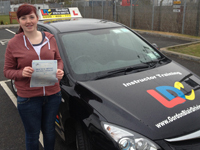 Sarah passed her driving test in Kirkcaldy. 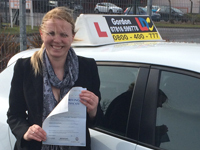 "Gordon was my second instructor and a fabulous one at that. He helped my driving so much and also made lessons very enjoyable! I definately would recommend him as an instructor. He also keeps calm and reassures you when when you make mistakes which was a great quality for me!! 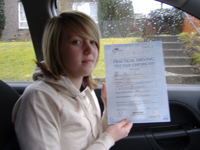 Karly passed her driving test in Kirkcaldy. 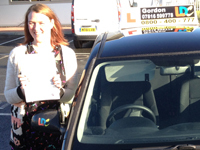 Christina passed her driving test in Kirkcaldy. "Gordon has the patience of a saint. I started as an extremely nervous driver and Gordon put me at ease. I never thought that I would ever pass my driving test but with Gordon's help I am now the proud owner of a pink licence". "Couldn't ask for a better instructor. 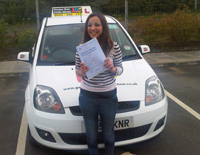 Thank you so much for everything and getting me passed 1st time". 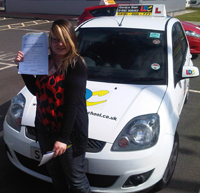 Katrina Salisbury passed her test in Kirkcaldy, Fife. 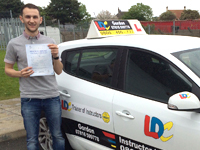 "Gordon has been a very good instructor. He always explained things fully and taught in an easy to understand way. Thank you". 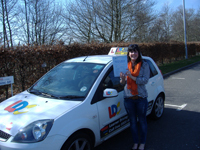 Rachel Scott, Kinross, Fife passed her driving test in Dunfermline. "Gordon has been a great help. His teaching pace was perfect and was very clear and concise with his explanations especially the manoeuvres. He was always very patient and made me feel very comfortable and I always looked forward to every lesson. 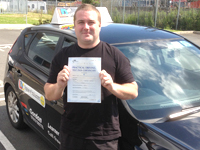 He is a first class driving instructor and I wouldn't hesitate to recommend him to anyone". 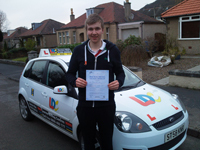 Mike Wood, Burntisland, Fife passed his driving test in Kirkcaldy, Fife. 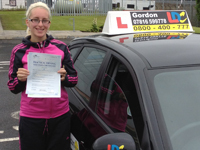 "I really enjoyed learning to drive with Gordon. Throughout the lessons he has been extremely patient with me. The pace of his teaching was just right and suited my learning as he wasn't too fast or too slow when going through the driving and different manoeuvres as this allowed me to learn them with ease. I would like to thank him for this. 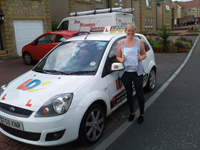 Lauren Byers passed her driving test in Kirkcaldy, Fife. 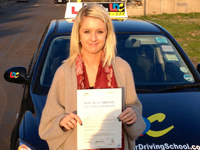 "I am very pleased to have passed my driving test due to my instructors patience and hard work. he has been absolutely fantastic and couldn't have done it without him. The best instructor in the area. I would definitely recommend him to everyone". 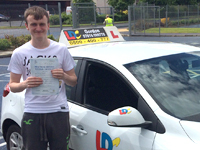 Steven Stewart Passed his driving test @ Dunfermline, Fife. 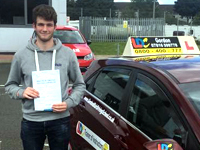 "Overall I was very happy with my lessons.Gordon was very thorough and patient. 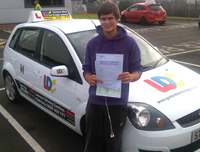 He was also very good at giving any advice that was needed and even showed me how to do things that were not part of the driving test. All in all Gordon was very good and I would recommend him to anyone. I wouldn't have passed my test without him". 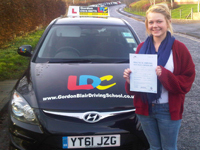 She wrote "Overall I enjoyed my lessons with Gordon. I enjoyed the fact that he has been patient and friendly. Gordon really takes his time to explain everything. I felt very relaxed as he communicated with me while teaching me to drive. 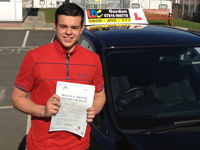 I would also recommend people to him as his driving school is well organised with great prices".